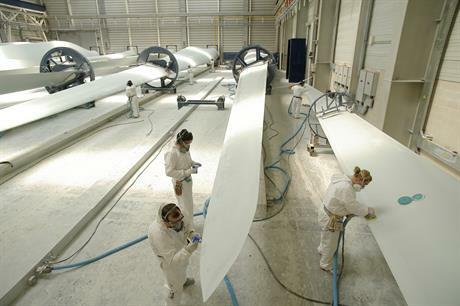 In direct contradiction to recent rhetoric by the president, the US wind power industry supports a record 114,000 American jobs, more than 500 domestic factories, and over $1 billion a year in revenue for states and communities. Government data placed the number of jobs in the coal industry at below 53,000. US projects paid $1.05 billion a year into rural communities via state and local taxes and through lease payments to landowners, according to the American Wind Energy Association’s (AWEA) annual evidence-based report. Of that, $761 million was paid in state and local taxes, which AWEA noted helps communities improve their school systems, fix roads and fund emergency services. The remaining $289 million a year in land lease payments serves as a valuable drought-proof cash crop for American farmers and ranchers, the trade group said. Capacity increased 8% in 2018 to 96,433MW of cumulative installed wind power, as of the end of 2018 — more than double the capacity the US had in 2010. There is now enough installed wind capacity to power more than 30 million US homes. Meanwhile wind projects installed in 2018 alone represented more than $12 billion in new private investment. "Wind power’s record-breaking year shows our industry is leading the way to a cleaner, stronger 21st century US economy," said AWEA CEO Tom Kiernan. Offshore wind development is also on the verge of taking off in the US. At the end of 2018, offshore developers had a potential pipeline of more than 25.5GW, said AWEA. Project developers expect six offshore wind projects, with a total of 2.1GW, to be operational by 2023.